This image from a glass slide is identified as the boiler at Herman Mosher's New Century oil well, circa 1900. According to local oil historian Stan Walker, the boiler would have been used to provide steam for a steam engine that provided the power to drill the well. 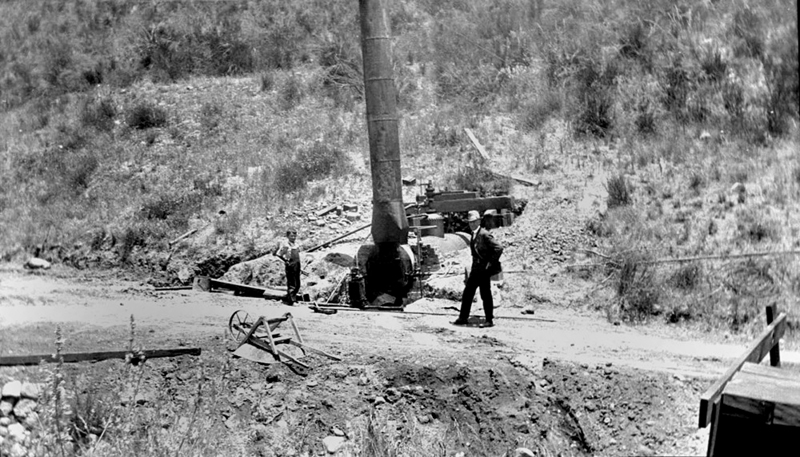 We don't know the exact location of the boiler, but we'd have to think it may have been near the New Century Oil Co.'s only productive well (of 5) in Placerita Canyon. The well was located on the site of the present-day oil seep on the Canyon Trial inside Placerita Canyon State and County Park. 30. As noted, the oil was discovered sometime after 1894 and it didn't start pumping until 1899. Reviewing the assertion from the other direction, two books published in 1876 may be considered primary sources for information on the exhibits displayed at Philadelphia. One is The Great Centennial Exhibition, P.W. Ziegler & Co., Philadelphia and Chicago; the other is The Illustrated History of the Centennial Exhibition, The National Publishing Co., Philadelphia, Chicago and St. Louis. At more than 544 and 918 pages, respectively, they purport to include "the great buildings and all of the objects of interest exhibited in them" (emphasis added). No mention is made of Placerita Canyon or any other white oil.